The following post has been co-written with my marketing shaman and fellow healer, Carrie Bancroft. We hope you enjoy our meeting of the minds! With the rest of the world, OUR heartS go out to France this week. Dory: Watching the famous spire of Notre Dame crumble in flames, I was struck by the chaos and disorder our world is quickly becoming. It is easy to feel that we are all going down in flames as the structures we have come to know, love and trust are burned to the ground (metaphorically, as well as literally!). As an elder shamanic healer, I have seen enough of the signs to know this is a cosmic lesson of epic proportions: collectively, we are being asked to awaken. And this is also Easter week, the week that Christ suffered his most challenging trials! Being a fully enlightened being, Christ knew what he’d signed up for when incarnating. He chose the path of martyrdom not as a victim, but as a human fully conscious of the eternal, enduring nature of the Soul. He knew that in dying, then being reborn, he would reveal the truth of human existence: there is no death and no separation in the realm of Spirit. Christ’s proverbial Tower was his mortal body, for he knew that it was only a temporary facade preventing him from embodying his true divinity. In resurrecting, he showed us that we all possess the ability to be reborn as pure Light Consciousness. Dory: It is interesting how the shamanic process of Dismemberment – an initiation intended to break down the practitioner’s limiting beliefs, thoughts and body (metaphorically or literally), so as to then rebuild them – mirrors Christ’s own journey of death and rebirth. Dismemberment can be intentional (a prepared ceremonial journey), or spontaneous (a life-threatening encounter or sudden onset of illness); it can be dramatic and ego-shaking, but it is always for the greater purpose of dying to one’s old ways and being ushered into a new way of seeing. It is my belief that we are in a time of collective dismemberment, where we are being asked to shed outdated beliefs, tenets and social expectations around material security (Carrie: our proverbial Towers!) and move into a new way of being that embraces unity, cooperation and reverence for this fragile planet we call home. 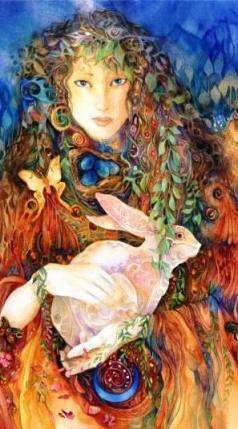 Carrie: Of course, Christ’s resurrection (or at least the celebration of it) has deep roots in old Germanic / Saxon spring celebrations of Ostara/Eostre, Goddess of fertility and rebirth (whose animal totem is Hare, in case you wondered where that part of Easter came from). And indeed, if we look below the structure of our modern monuments, we often find vestiges of our ancient ancestral past: under Notre Dame (“Our Mother”) lies an ancient Gallic sacred site, for example. In this symbolism, we see the cycles of death and rebirth, where the passing of one tradition gives birth to another. Dory: This month, we invite you to examine your own cycles of death and rebirth. If parts of your life feel like they are falling apart, perhaps you too would benefit from viewing the process as a symbolic dismemberment of what is no longer serving your greatest good. In allowing yourself to view these circumstances with objective awareness, the bigger lessons will soon present themselves, allowing you to gracefully step into your own cycle of being reborn. May we all know peace, love and truth on this day, and all days.